Weimar Germany produced many of film history’s most memorable masterpieces. This half-day guided tour traces the lives of those who contributed to it – as well as those who had to flee no sooner than Weimar Germany had become history. Weimar Cinema is synonymous with not just all kinds of masterpieces in film history, but also all sorts of inventions that revolutionized cinema and the way films were made. Films like “Metropolis”, “The Blue Angel”, “Nosferatu”, “Fräulein Else” are all part of our collective memory and have left their mark on the cinematic landscape. However, most of its contributors had to flee Germany after 1933 once the Nazis had risen to power because they were Jewish. Others, like Lilli Palmer, were forced to flee Nazi Germany even before they had the chance to leave their mark on German film history – only to return 20 years later to become one of this country’s biggest post-war stars! In actual fact, this private guided tour shows you were some of those directors, writers, and actors lived before their emigration, which means that this tour is as much about cinema history as it is about the Nazi persecution of the Jews. Moreover, it highlights what German cinema has lost. And never regained. To this day. Just so you know: This guided tour is primarily for cinephiles and then one for those who are interested in hearing the various stories of flight, exile and expulsion during the Nazi era. It is a tour that is a little on the strenuous side as it involves a great deal of walking as well as criss-crossing the city by various means of public transport (Metro, S-Bahn, bus). That said, trust me, it is well worth it! For you will not only see some impressive buildings and houses, but also areas of Berlin the casual tourist never gets to see for the simple reason because they don’t even know they exist. This guided tour, exclusively offered by Berlin Tours, starts at Nollendorf Platz. From there, we will visit the erstwhile homes (sometimes even the birthplaces) of the following people (in this order): Christopher Isherwood, Billy Wilder, Lilian Harvey, Elisabeth Bergner, Vicki Baum, F. W. Murnau, Lilli Palmer, Ernst Lubitsch, Marlene Dietrich. Anyone who’s into film will know, of course, about the significance of these names for the history of film. But the stories behind the names are just as interesting, and sadly, sometimes even tragic. Admired and revered by the French, the attitude of the Germans – me excepted! – towards this 20th century icon is more controversial, ranging from admiration and adulation to feelings of betrayal, not just for having eventually deserted Germany, but for having stripped herself off her detested Sissi-image, an image the Germans loved her for and an image who represented post-war West-Germany like no other, making it so easy and comfortable for them to forget what they had done just ten years earlier. Something in which Romy’s mother was, if not complicit, at least not entirely without responsibility: after all, she was one of Hitler’s favourite actresses and his neighbour in Berchtesgaden. A fact Romy felt – understandably, yet needlessly – guilty for all her life. I’ve always been an admirer of Romy Schneider, and not just because I lived in Paris for so long, I, too, admire her a lot more in her French films than in her German ones. But more than her films, I admire the woman, Romy Schneider, which is the reason why I included this tour in my Berlin Tours portfolio: I consider it my humble contribution to make sure that by offering a guided tour tracing her time in Berlin, this wonderful, talented, yet tragic lady won’t ever be forgotten. During this walking tour (which does involve the use of public transport) Berlin Tours goes back in time, tracing Romy’s on-and-off life in Berlin, lived primarily from the mid-1960s to the early 1970s. Meeting up at Europa Center (which she opened as her stepfather was one of its main investors), we’ll walk over to the Savoy Hotel, where she loved to stay in (e.g. while shooting her last film, “La passante de Sans Souci”) and whose guest book she signed. Then, we’ll take the S-Bahn to Grunewald, from where we’ll walk to Romy’s former home on Winklerstrasse 22. Next, we’ll take a stroll down to Lake Diana, where Romy spent a lot of time with her newly born son, David, who later so tragically died. Lastly, we’ll walk up to the Schlosshotel Grunewald (back then called Hotel Gerhus) where a coffee/ tea/ or lunch break is optional. The nearby S-Bahn will take us back to the centre of town in just a few stops. 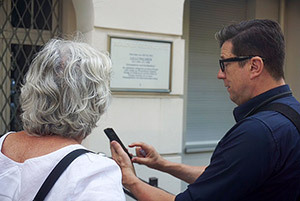 Trace places and locations with Berlin Tours connected with one of the world’s most iconic personalities. Marlene Dietrich was a figure especially older Germans felt ambiguous about while younger generations – like myself – have admired her and looked up to her from the word go: for her courage, her glamour, her style, her wit, her versatility, and last but not last, her staying power. That’s why I feel very strongly about her and am passionate about showing visitors to Berlin during this walking tour (involving the use of public transport) where traces of Dietrich can still be found right here, in her hometown. This guided tour starts in Schöneberg, where Dietrich was born (incidentally, not far away from where one of her friends, later in life – Hildegard Knef – also used to live). From there, we will check out to another one of Dietrich’s childhood homes, before we will proceed to Potsdamer Platz, first to the Marlene Dietrich Square, and from there to the Boulevard of the Stars where Dietrich has her very own smack in its centre, after all, no star shone brighter than hers! Then, our guided tour continues by entering the Film Museum, located across the street, which houses the Marlene Dietrich Collection where many of her gowns, her letters and other private possessions are on show. 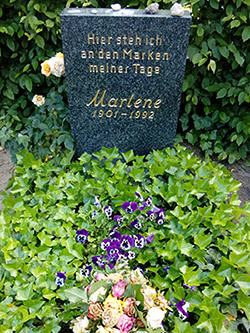 Lastly, we will go to the cemetery where Marlene Dietrich found her final resting place, in the leafy district of Friedenau, which is located in Berlin’s south-west. Berlin has long been one of Europe’s gay capitals – this guided tour across Gay Berlin explains you why. When Christopher Isherwood settled in Berlin in 1929, he did so because of Berlin’s pervasive libertinage, its liberal, anything-goes-attitude. Of course the Nazis would swiftly do away with all that. But the spirit of the 1920s was eventually rekindled in the 1970s – after all, David Bowie and Iggy Pop moved here for a reason – and lives on to this day, albeit in an altered state, so to speak. This walking tour (which does involve some use of public transport) traces Berlin gay life past and present, bearing in mind that due to the Internet and luckily, some progress in social acceptance, gay life is no longer that distinguishable from . . . the lives of others! The tour starts at Nollendorfplatz, where the first memorial for the persecution of gays and lesbians was inaugurated back in the 1980s. It is also the heart of the Gay Village and it is in this neckof the woods, that Christopher Isherwood used to stay between 1929 and 1933. The building he lived in survived the war unscathed. From there, we zig-zag through the Village while I point out certain places, bars, clubs, etc. whose history has had some relevance to gay life in Berlin, like, for instance, the notoriously sleazy El Dorado nightclub, one of Berlin’s hottest tickets back in the 1920s, attracting Berliners and foreigners alike, among them Marlene Dietrich, no less! Then we’ll board the bus 100 to take us to the Spree-Ufer, where I’ll show you the newly inaugurated memorial to the first Gay Emancipation Movement while also pointing out where exactly Magnus Hirschfeld’s ground-breaking Institute for Sexual Research used to be located (its building no longer exists). Then we’ll walk back to the bus stop, taking the bus 100 to Brandenburg Gate, from where we’ll walk to the Official Memorial for the Murdered Gays and Lesbians, designed by Dragset and Elmgreen. Walking over to Potsdamer Platz, we’ll take the bus to Lützow Strasse, where our tour finishes at the world’s only Gay Museum, a museum dedicated to the Gay Movement in Berlin, but which also offers glimpses in gay life and gay movements around the globe and often showcases topics related to the gay community. Having lived in Paris, London and many other places, I know how trying it can be travelling with dogs as they tend to be forbidden everywhere – in trains, restaurants, bars, public transport, and in public parks they have to be put on a lead. First of all, an estimated 200,000 dogs live in Berlin and luckily, grocery stores aside, dogs are allowed here pretty much everywhere, and trust me, being a dog owner myself, that’s one of the reasons why Berlin as a city is unbeatable. It does help, of course, that Berlin is full of parks and forests for dogs to roam in, and it is exactly to one of those – Tiergarten, Berlin’s equivalent to New York’s Central Park – that I intend to take you on an extended walking tour. Plus your dog(s), of course! Unlike Central Park, though, Tiergarten changes its face depending which part of it you’re in, which is already an indicator just how big it is. You don’t believe me? Just look at a Berlin map! At times, Tiergarten is more like a forest, almost jungle-like, and then again, it has its landscaped parts and other sections that are nothing but tree-dotted lawns. Those are the ones my dog, Lucas, is most crazy about. 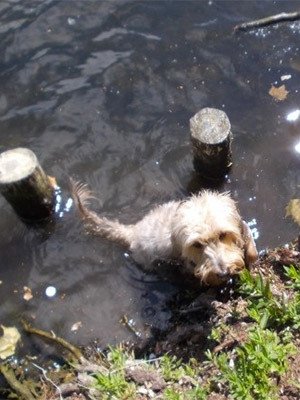 But not only is Tiergarten a fabulous place for dogs to run and roam in – without a lead! – but it also boasts also many sights, monuments, and landmarks, among them the fabulous Composers Memorial (Haydn-Beethoven – Mozart), the Venus Bassin, the Queen Louise statue and that of her husband – King Frederick William III – the beautifully landscaped Rose Garden, the Victory Column, not to mention the abundance of ponds and lakes! On a hot summer day, there’s nothing better than a stroll – plus sightseeing – through this former royal hunting ground and end it with a pint of beer in one of its several beer gardens. So, if in Berlin, with your dog(s), why not get in touch with Berlin Tours for a long walking tour through this amazingly beautiful, many-faceted, park!